It is seen as wear on braking surface. It occurs on normal operating conditions. It is seen as fine heat cracks. It occurs on normal operating conditions due to normal heating and cooling of brake disc. If the cracks do not develop deeper than 1.5 mm, regring disc. It is seen as deep surface cracks. It happens due to excessive heating. Check balance between wheels, axle and trailer. 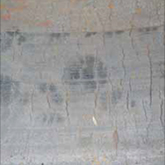 It is seen as raised hard and colorful spots on braking surface. It can be cleaned by turning if tolerance allows. If it stays, replace the disc. It is seen as grooves on disc mirror surface. It is a kind of wear pattern. It occurs because of that lining iron contact with the disc. If depth does not exceed 0.5 mm, regrined. It is seen as blue colouring on disc surface. 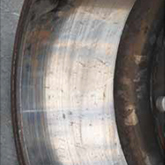 It is seen as braking friction on disc surface. Check caliper clearance and operation. It is seen as rusting on ABS sensors. 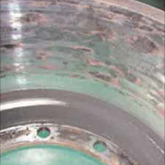 Failure of anti-corrosive on ABS. Remove rust on the teeth with wire bush. 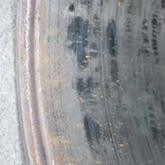 It is seen as clear grooves on braking surface. Brake shoe contacts with drum. Brake drum seperated from mount circle. Intense pressure of brake system. Poor mechanical resistance due to casting not being produced aaccording to international standards. Excessive overheating and rapid cooling. Blue/yellow discolouration seen as blueing effect. 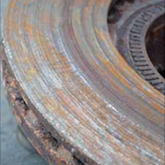 Brake drum has been subjected to large accumulation of heating. Brake shoe contacts with drum constantly. Ensure brakes are adjusted properly. Imbalanced wear on braking surface. Driver can detect it on foot brake application by vibration or juddering. Brake drum could have been dropped on a hard surface. 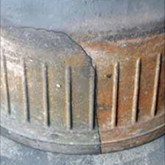 Hard impact on outer side of the drum. 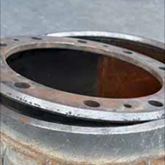 Brake drum may not be holded properly in the course of turning process. Drum can be regrinded if tolerance allows. If it is beyond the tolerances, replace the drum. 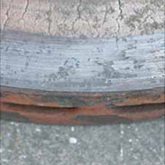 It is seen as fine and short cracks on braking surface. 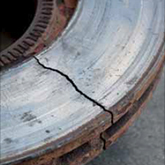 In early stages, the cracks may not affect the braking performance but should be inspected regularly. Overheating of brake lining surface. Go for inspections to see if the cracks become more serious. If it happens, replace the drum. Mirror-like appearance on braking surface. Using the vehicle unloaded constantly. Sand brake surface of drum. 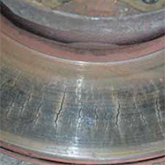 Large cracks across braking surface. 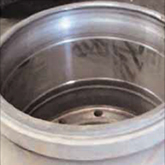 Brake drums not being casted or turned according to international standards. Check brake systems for faults. Grease and oil stains on brake surface. Driver can notice judder on foot brake application. Storing drums on their side may result in ovality problems. Stacking drums inside one another could result in ovality and defects on the surface. Do not overload your vehicle more than the load limit. Try to drive your vehicle in the manner to use brake minimum. Have periodic maintenances of brakes made. The space between brake drum and brake lining (brake adjustment) should be controlled all the time. In addition, this situaiton increases fuel consuming. Water contact with brake drum or brake disc should be avoided when they are hot. This will cause cracks on brake drums and brake discs. You should not put the parking brake (handbrake)on when brake drums or brake discs are hot; you should wait them to cool instead; otherwise, ovality may form on the brake drum or brake disc surface. WHEN SHOULD BRAKE DRUM BE REPLACED? 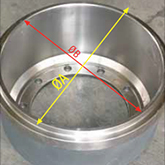 Brake drums of which diameter sizes are at the maximum level (finished brake drums). 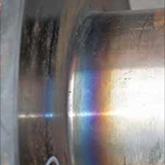 Brake drums exposed to overheating. 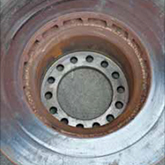 Brake drums in which hard spots formed. 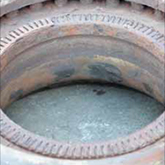 Brake drums of which wheel bolt holes become worn-out. 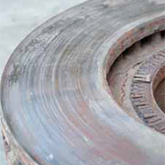 Brake drums of which lining surface have deep scratches which can not be fixed by turning. 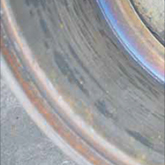 Brake drums which are determined to be oval when controlled. In order to have accurate effective braking performance, brake drums and discs should be replaced as pair.
.	Before installing a new brake drum on hub, we strongly recommend that parts which contact with brake drum and hub should be cleaned if there are any faults such as rust, burr or scratch which may affect the balance. After this process, brake drum should be installed on hub. After installing process, balance should be adjusted by metal removing, when drum, rim and wheel is fixed. The reason is that they can never result in zero balance as brake drum and hub are separate parts from each other. It is the most accurate way to make finishing by metal removing when parts are fixed to each other. This does not mean that brake drum or hub is manufactured a result of balance defective production; however, they can not provide the balance of one part as they are manufactured separately from each other. We perform this process as if we combine brake drum and hub into one pice by turning. We strongly recommend to install brake drum in this way.
.	More than half of the brake drum and brake disc faults are related to extreme heating. Brake drums and brake discs are heated parts because of the fact that they are made of cast-iron and they always contact with brake lining. There are some tasks to be done by drivers in this issue on extending life of brake drum and brake disc. Try to decelerate as much as possible using retarder. Use brakes at minimum level by using lower gears especially in sloping downward roads. Do not try to cool the parts by using water, please wait them to cool by themselves. Do not park your vehicle while emergency brake is on, especially when the parts are hot. This will result in ovality on brake drums and brake discs. Sledge hammers and hammers should not be used when brake drums or brake discs are fitted on hub. They might be broken as the parts are made of cast iron.